This extremely easy and simple to use Excel Timesheet will keep track of employees hours. It allows the specification and setting of unpaid breaks in 5 minute intervals on both a daily and employee basis. If employees work hours that span into a new day, the time calculations are designed to accommodate this. All Start and End times span a 24 hour period in 5 minute intervals, all that is required is to select a Start time and an End time from a drop down list. This makes it impossible to enter times that Excel cannot recognize. The Timesheet can incorporate up to a 12 week period with any week and/or day being optional. Employee names need only to be entered once and then the workbook saved as a template for future use. The employee names are entered in the cells below Employee Name on Week1 only. The same names will automatically flow through Weeks 2 to 12. On clicking the Set Weeks button on Week1 the number of weeks to be used can be specified. If one of the Weeks only includes part of that Week then times for those other dates can be simply omitted from input. For example, if an entire calendar month is to be covered, the Weeks can be set to 5 then the starting date selected from directly below Week 1 and times that correspond with the same month on Week5 are only filled out. On selecting the starting date from directly below Week 1, 7 day periods will automatically flow through to all other Week sheets. The workbook can then be saved as a template for future use with the same defaults. After saving as a template the Timesheet can be added to any Workbook by right clicking on any Worksheet Name tab and selecting Insert and choosing .xlt template file. Copy All Times to Next Week - a fast and easy way to duplicate times from one week to another. Sort A-Z and Sort Z-A will sort all Week sheets in one go. Timesheet Summary Page - The Totals sheet has a very easy to use Pivot Table which is based off all employees and their hours. Results can be displayed by Week and/or by Name or show All Names and/or All Weeks. Double clicking on any hours within the Total Hours field will give a Break Down of the displayed data. Set Weeks - After saving the Timesheet, with all 12 weeks the Set Weeks button can be clicked to specify how many weeks to use in future applications. 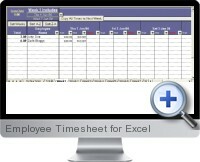 Timesheet Printing - By using the employee Timesheet Print only sheets that have times entered will be shown. Selection can then be made on all, or only some, of these sheets to print. The print of each sheet will only include the names (and their associated times) which have been entered. There is an option to have the current date placed as a left footer of each sheet with the chosen format. If no format is chosen, no left footer is used. Alternatively, Excel's standard method of printing can be used.